Promotional scarves are a must have for any business serious about their marketing campaign. With just a small investment you can own one of the most under utilised promotional products out there! Picture this, a previous customer is in a rush to meet their friends for some drinks on a cold winter night. As they go to leave they realise that they better wrap up warm so take an ultra soft, high quality scarf hanging off their wardrobe. As they meet their friends they question what logo is printed on the side of the scarf...it is your businesses logo. Suddenly a group of 10 are now aware of your brand as the result of one promotional item! Read below for more info and order yours today. Why products like these are so effective! Branded merchandise such as printed scarves or printed gloves are essentially interactive marketing campaigns. They can be felt, seen and used day in day out. Recipients are much more likely to keep a high quality product that serves a purpose than a leaflet or flyer. They are also more likely to take notice of the brand giving them away than if they where to see a picture of their logo on an online advert. They are useful and target audiences personally and can make them feel connected to your brand. Try something new with your advertising today and order custom printed scarves! Compared to the promotional pen or mug, the scarf is a more unusual choice and this unique appeal will definitely get your business noticed by your clients, making them remember your brand. As part of clothing themed promotional gift bags, these would go nicely with similar items such as our promotional knitwear, shirts, sweatshirts, hoodies, gloves and promotional caps. Useful items are always the best promotional items because it ensures your clients and business partners will be exposed to your branding on a regular basis. These promotional accessories can be given out at events, exhibitions, or to employees as thoughtful thank-you gifts. In ancient Rome, the main function of the scarf is the exact opposite of today! It was still worn around the neck, but it was used to wipe sweat away from the neck and face in hot weather. Today scarves come in hundreds of styles and almost as many uses. In the allbranded shop we have many styles to choose from in different fabrics and colour choices. We have chunky knitted scarves made from polyacrylic, lighter ones made from yarn, there are also triangular shapes ones in the classic bandana style, this comes in a brighter choice of colours and is made from a polyester and cotton blend. 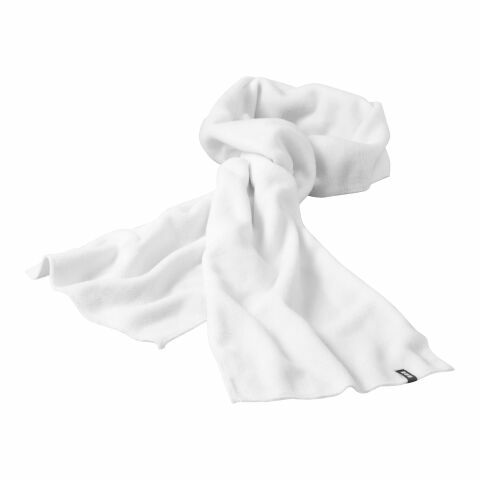 Have a look through our web shop to discover the right promotional scarves for your business. As such a useful product, promotional scarves are a brilliant choice to use because they are practical and will get daily use. As your business partners and clients walk down the street wearing your promotional scarves, they will encounter many of the public throughout their day, increasing your advertising reach. People are also naturally interested in what their friends and associates are wearing, so you can be sure many people will ask the recipients of these promotional scarves where they are from. Should your clients go on holiday your business will be exposed to a whole new market of potential customers from across the world. Wherever your promotional scarves travel to, your business logo will be seen by countless civilians, and awareness of your business will increase rapidly. We have scarves made from polyester, wool, cotton and fleece, there are wrap around scarves and bandana style ones. The amount of choice in our web shop allows you to choose the right promotional scarf to fit your marketing campaign. As well as choosing the base colour and the style of scarf, you also have the choice to have your business artwork printed on the front, to extend your advertising reach. If you’re unsure of where to begin, don’t hesitate to give our friendly team a call. We’ll be happy to help you through every stage of the design process.